We have a new WDSF world champion!!! Armin Frauenknecht from Germany is our new world champion 2017, with his partner, Austrian High Spirit Agent Ayk, he will go as a wildcard to the FCI WC IPO in September in Germany. This event was filmed by workingdog. All videos can be found here. Congratulations from us to all the winners. The whole score lists you can find here. 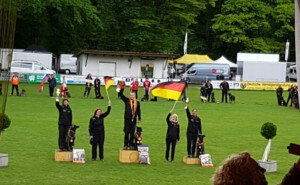 It was an amazing event with fantastic dogs competing at different venues. We saw 47 participants in IPO, 31 participants in obedience and 30 participants in agility. There were 17 nations represented. We are so happy to see that the dutch shepherd family is growing every year. The venue was perfectly prepared, the catering was excellent and all the helpers were always friendly. The festive evening was great organized, with live music, good food and good mood. It was celebrated until the late evening hours. We want ot thank all the competitors, supporters and visitors and of course the organization team. You all made this weekend to a special memory, thank you!!! 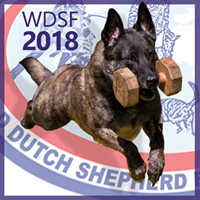 The next WDSF world championship will be held in Roden / Netherlands from May 4th to 6th 2018. The host will be the NHC in cooperation with Hondensport Hoogkerk. This will be the 5th aniversary of the WDSF world championship and we are very proud that it will be back to the motherland of our fantastic breed. As you all know, the hosting of other sports is voluntary and the decision is taken by the host club. At the moment, it is not yet clear which other sports will be offered. As soon as the host has made a decision, we will publish it in a timely manner. The official wc homepage will be online verry soon. You can also find all news about the world championship at the Facebook Page of the wc. A few weeks ago, all members received a letter from our secretary. In this letter, we asked you to vote for 2 candidates for the board.We want to introduce both candidates here again. If approved, they will take over the duties of General Board member and Treasurer respectably. This special election is due to recently vacated positions on the Board. Please read the introduction of both candidates and give your vote before the 10th of August 2017 as described in the letter. Hi all Dutch Shepherds Friends !My name is Lars Brink and I am a nowadays retired policeman.I have previously been involved in various sports, among them as a goalkeeper in football, however badminton which I began practicing at 10 years of age became my favourite. Until just a few years ago I also trained youth in the sport.Dogs of different breeds have always been a part of my life. In 2003 I was asked by my colleague Lars Czylwik if I wanted to help and take care of his dog Oscar, to give the dog a happy retirement. The year after, Oscar’s half-sister Rha also joined us.This is how my interest in Dutch Shepherd Dogs began. I became a member of RHH (Swedish Dutch Shepherd Club) and was also quickly granted the role as their treasurer. I have always had an interest in numbers and I have acted as a treasurer for different organisations since 1972.When I was asked if I was interested in a position as treasurer for the WDSF the answer was very simple, and I am looking forward to it. We are still looking forward for more Contries as members of the WDSF! !